Low Carb Glazed Pretzels Recipe - Seriously TASTY & Doughy! 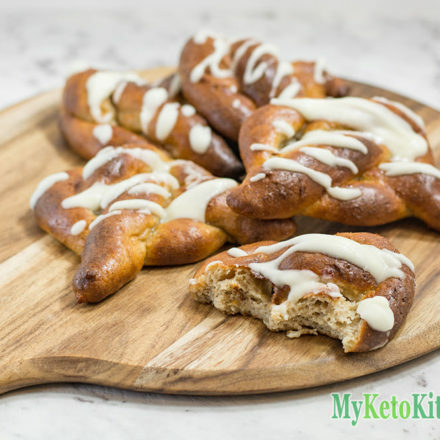 These Low Carb Pretzels are mouthwateringly delicious and very, very hard to resist coated in a sweet glaze. 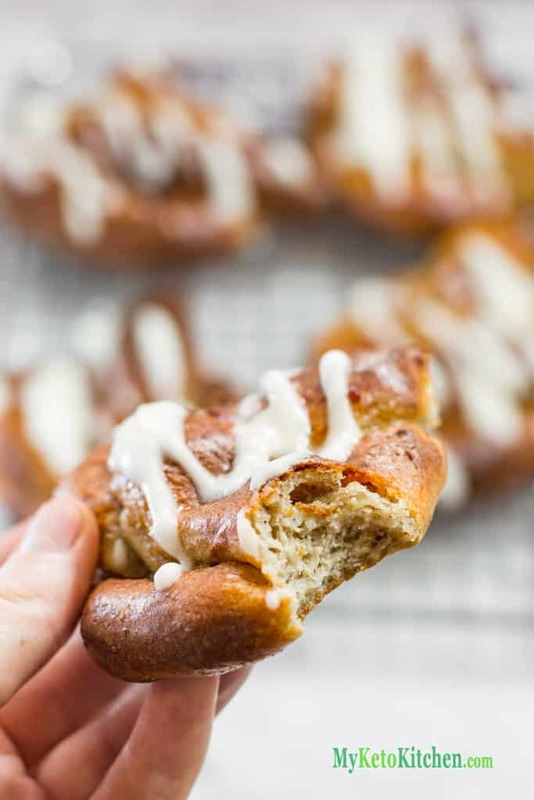 You don’t have to glaze these low carb pretzels if you don’t wish. Despite the savory ingredients, there is not even a hint of cheese taste in the baked Glazed Pretzels. 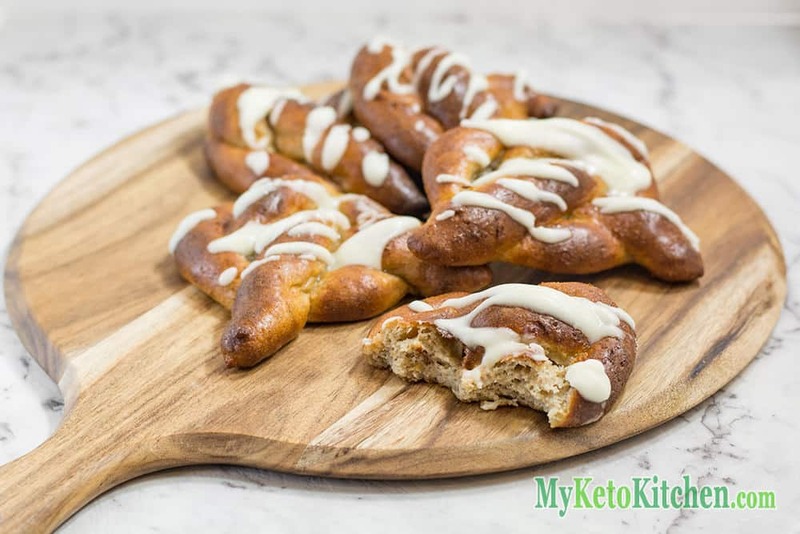 They are a whole new take on our original Keto Soft Pretzels Recipe. Note: The xanthum gum is an essential ingredient to this recipe. I did attempt a batch without it (I admit, I forgot to add it) and the pretzels turned into flat discs with hard edges that were not enjoyable at all. Place the mozzarella, cream cheese and butter into a heatproof bowl, or a small saucepan, and microwave or heat on the stove until completely melted. While the cheese is melting, add the yeast to a mixing bowl and sprinkle over the warm water. Allow to sit for a minute. In your stand mixer bowl, add the almond flour, Natvia, xanthum gum and spices, and mix with the paddle attachment. Add the yeast and eggs to the dry ingredients and mix. Carefully pour the molten cheese into the other ingredients and mix well, pausing the scrape down any almond mixture that has stuck to the sides. Continue to mix the dough until all the ingredients are really well combined. Split the dough into 12 balls and leave to rest for 2 minutes. Roll each ball into a long thin “sausage”, then twist into a pretzel shape. The dough is quite sticky and won’t roll out well on some surfaces, I found that a plastic cutting board like this worked well, but my granite bench tops did not. Place the pretzels onto a lined cookie sheet, allowing space for them to rise and spread. Bake in the oven for 12-20 minutes. Check after 12 minutes, pretzels are cooked when they are golden brown on both the tops and bottoms. Set aside to cool for at least 15 minutes before glazing. In a mixing bowl, place the Natvia Icing Mix. Add the water a little bit at a time until the glaze has reached a pourable consistency. Drizzle the glaze over the cooling pretzels. Enjoy immediately or wait for the glaze to set. Beware – they are addictive! 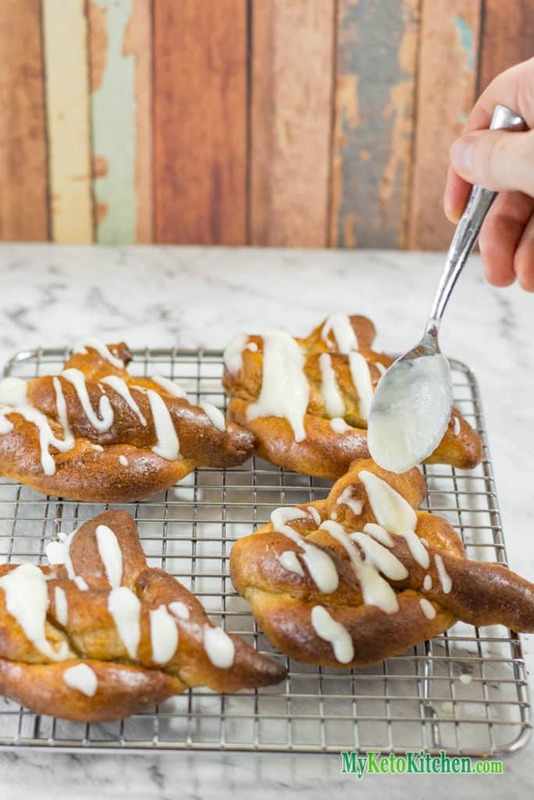 These Low Carb Pretzels are mouthwateringly delicious and very, very hard to resist coated in a sweet glaze that is sugar-free. Enjoy immediately or wait for the glaze to set. Beware - they are addictive! To make this Low Carb Glazed Pretzels recipe in a larger batch adjust the serving amounts in the card above. This is fantastic. I was going to try adapting the pretzel recipe for Easter Buns. I might add a few currants, cos I do like them with fruit. I know they won’t be keto, but still grain free which is most important for hubs, who loves his hottie buns. 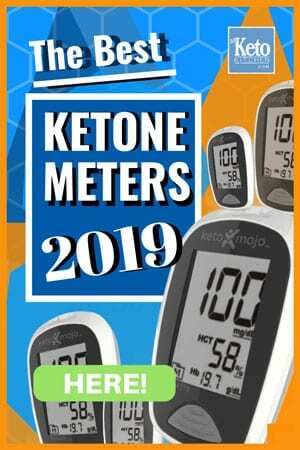 That is a great idea for anyone who is grain free, but not keto. I would suggest dropping the oven temperature and increasing the baking time if you are keeping to the 12 bun servings, it will make sure the inside is cooked before the outside gets too brown. I hope he enjoys them! Can I use Swerve Granular and Powdered (for icing) for this recipe instead of Natvia? These were absolutely delicious. The best mozzarella pastry yet! It was hard to eat just one. Thank you so much for sharing the recipe. Swerve worked fine. This is second time i made them (delish)! Both times, however, they de-puffed or wrinkled after taking out of oven. What could I be doing wrong? Thanks so much for great recipe though. I had the same thing happen when I turned half a batch of pretzels into donut balls. The preztels came out perfect and the donut balls became wrinkly. It could be that they have overcooked, due to different ovens having slight differences in temperature. Try reducing the cooking time by a few minutes and see if that helps. Good morning, Gerri. I just wanted to say that I am definitely looking forward to making this deliciously-looking recipe tonight for dessert. as part of Christmas Eve. I am so curious to see how the yeast works with this recipe as this will be the first keto recipe that I have used yeast in. One Question: What type of yeast should I use? Active Dry Yeast…Rapid Rise…? Also, when I switch from Imperial to Metric, the Glaze section does not convert. The measurements under the Pretzel section convert without a problem. Thank you for providing such thorough recipes and an easy way to convert from one measurement system to another. I look forward to exploring more of your blog! The yeast needs food (sugars or inulin) to react and rise, we add it just to get that “bread” flavor and smell, you can use any dry yeast that you have on hand. Thank you for your kind words and we hope you have a great Christmas. Best Recipe Ever, Seriously a game changer for me. I use the plain pretzel recipe version for bread rolls, which turn out perfect and stay fresh all week on the counter, in winter. The sweet version i use for donuts and eclairs and anything else i want to create with a bready texture. I really cant thank you enough for sharing this, its the ultimate recipe. BTW, i add half a strawberry to my yeast mixture, gets really frothy that way.